The making of Many Moons was a year and a half long endeavor that began the day I sat with Margaret in the spring of 2008 waiting for our kids to finish their swim practice. We knew each other best as yogi friends participating in a local ‘Yoga Sutra’ discussion group together. But instead of diving into a conversation about the path to enlightenment that day, we were discussing best places to buy fabric. Sitting at the edge of the pool with the background music of rhythmic slap and splash, I shared about my recent quilting work, and she shared about recent sewing projects she was enjoying with her daughter. 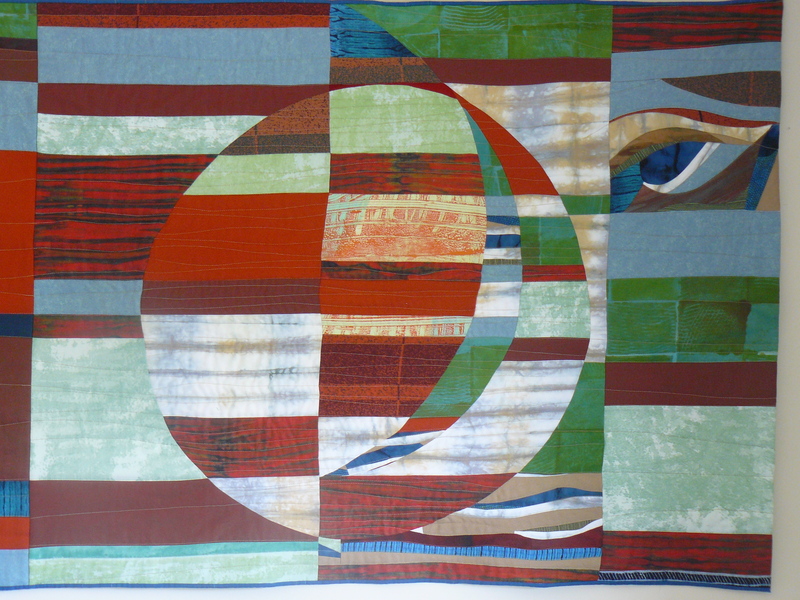 She asked about seeing my quilts, saying she had an oddly shaped wall in her kitchen great room that she was reserving for fabric art, maybe I had something? There was no pause, no thinking this over, she simply followed me home right after practice to look at what I had to offer. I laid all my finished pieces out on the floor of my small home studio. On her knees, she flipped through the stack of finished quilts like pages of a book, expressing her delight with oooh’s and ahhhh’s, stopping at a few she really liked, knowing they were all the wrong size for her wall. Eventually she looked up and with the expression of one ready to make a commitment and asked, Do you do commission work? Me smiling, Of course. That settled it. I went to her house the next day, measured the wall the quilt would be living on, and began to dream. 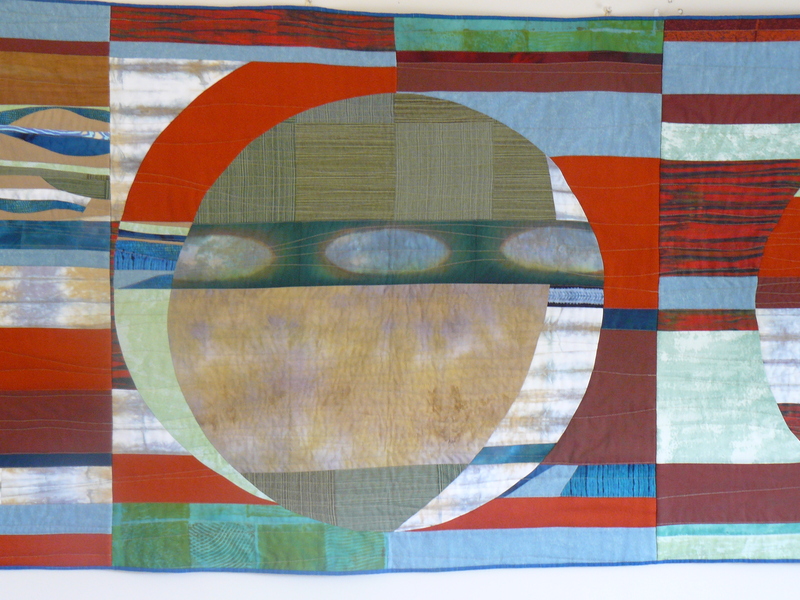 One of the many extraordinary aspects of making this piece on commission was the way Margaret engaged with the process. I had picked the palette of color and fabric that I knew resonated for her. But beyond that, she felt no need to be involved. When I asked if she wanted to review some sketches I had made for a conceptual design she said, No, I trust that what you make will be exactly right. I had permission to follow the energy of what was developing without conditions, without an agenda. And where I was growing used to this in my own process and work, it was the first time I consciously experienced such unconditional trust from another, and the creative freedom that can result. It would be months before I actually began making something. Margaret was in no hurry, and I was waiting for inspiration. It finally came with a series of photographs taken at Cape Cod walking the beach during low tide on the bay side, where the retreating water would leave evocative patterns in a vast expanse of sand. I was a year divorced. I had just finished the third year of my Energy Medicine Training. I was in love. I knew that much. But there was nothing clear about the feeling. I couldn’t grasp what honestly expressed love looked or felt like. I was living with this emotion from inside a tightly wound ball that had begun to unravel. I couldn’t dare focus on the possibility that I might be in love with my teacher Richard, that it might have been this love that finally broke my marriage beyond repair. I drifted along those broad stretches alone after each low tide feeling the grief that seemed to be with me all the time now. I was mesmerized by the beautiful grooves that would pull me along and then suddenly morph into something else as another stream merged with it. I was in love. I would follow a specific combination of shadow and water in each rivulet with my eyes, while feeling the silky texture of the tender ridges collapse under my footsteps. This vast terrain was so exposed in the retreating tide, so vulnerable to the slightest intervention. How could I not pay attention to what was shifting inside of me too? My connection to teacher Richard was held by the firm boundaries of a teacher student relationship. Famous throughout the school for his hugs, he would simply open his arms and wait for you to enter his enormous energetic field. His large arms would enfold ever so gently but firmly and here he would stay for what seemed like a very long time. It was impossible not to sigh and settle in trust in one of his hugs. At the end of a class weekend during the first year of our training, I waited to be the last to say goodbye to him, wanting one of his famous hugs in the worst way. Open and vulnerable from the transformative work of the weekend, I would be returning home to a husband who was resentful of the process I had chosen to engage in, and two children who were sensing the shifts occurring in their mother, but with no clear understanding why. It would be years before I understood that the intimacy that felt so intermittently captivating from this work could be something constant. In the meantime, I needed the validation of physical heart to heart with another human being. Standing there that night in a hug with teacher Richard, something light and timeless opened in me. I heard sobs even in the absence of tears. Deep resonant sobs that infused every molecule of the space I seemed to be suspended in. Were they my sobs or Richard’s? Maybe universal collective sobs? I would never know. The hug ended. We said goodnight, the outside face of this simple ritual exchange of two people parting ordinary and typical. But for me, everything changed in that moment. The trajectory of whatever path I had been on up to that moment veered off in a very different direction. I was sure that what I had experienced was some kind of love. Not like any kind of love I thought I knew. This love had the terrifying power to catapult me completely and irrevocably into unknown territory. And even though I knew Richard was just being my teacher, I couldn’t extricate myself from the man. I drove home dazzled by the reel that had begun running in my head, flashing through every love I thought I had experienced with every man I thought was ‘the one’. It was then that I remembered the dream about ‘the fat man in the water that I am in love with’. I realized Richard was the image of the man in the dream. Driving the highway in a kind of numb I could only feel when caught in a lie, this felt ten times worse because I didn’t even know there had been a lie to catch. I had been so sure that dream was about my husband John. Teacher aside, I was lost to a torrent of emotion. I surrendered. The only thing I could do was strap myself in and go along for the ride. Months of dark night of the soul sleeplessness followed. It was a poignant time with my husband. He was convinced I was having an affair, and I was terrified of the affair of the heart I knew I was engaged in. I didn’t know how to tell him about my experience with teacher Richard without shattering the illusion of love that was still tethering me to my marriage. That tether finally snapped one night when he found me huddled in a corner of the living room couch in the dark of wee hours. He demanded to know what was wrong with me. When I couldn’t offer anything coherent beyond, something is opening in me and I don’t know what it is, he simply and definitively told me he didn’t want to go there with me. 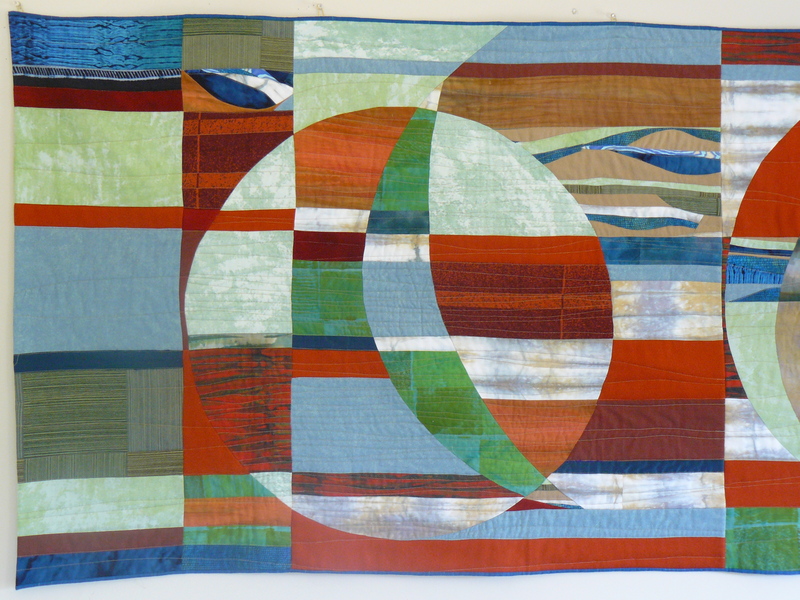 The quilt finally began as an exploration of repeating forms left from the retreating waves in sand, undulating lines that could move across the very long stretch of wall wanting to be filled in Margaret’s home. I could see and feel each moment in each ripple of each photograph, a continuum of energy that could easily morph into form. I don’t know where the series of spheres came from or exactly when they appeared. It was if the waves opened up on a whim or impulse and made space for them to be seen. In sequence, like phases of a single moon capturing a moment of illumination in the cycle of its orbit. Or like many moons, with the face of a shared story. Well! I’m as speechless now as I was clueless then, smile. You have composed so many exquisite sentences. “The vast terrain…” — those last couple of sentences in that paragraph, beautiful. Can’t wait for the rest of the chapter!